Distillery making "Only the Very Best"
PRINCESS ANNE — Tom Cropper’s family has been on the Eastern Shore since 1629. After nearly 400 years he’s the first to try his hand as a commercial liquor distiller right here in Somerset County. But it was a long way from a “surfer dude” to a maker of rum and moonshine. Then he was enticed to join the Army during the Vietnam War, with Uncle Sam promising to train him as a pilot for Huey helicopters. “The recruiter didn’t tell me they were killing 200 pilots a week at the time. By the time I finished flight school the war was about over. As it turned out, I never went to Vietnam, Cropper said. “In 1975 I was a Warrant Officer, the youngest (at 19) in the United States Army.” After six years in the service, Cropper be came a “dredging,” dredging the channel in and around Ocean City. “I was setting cable on the jetty in March and noticed a big wave and got washed right off the jetty. It was cold. That freak accident changed his professional life. Now, he’s embarking on a new role in life. And, just like his epiphany of “learning computers,” Cropper is building his new professional life one lesson at a time as he masters the art of commercial distilling. After establishing OTVB (Only the Very Best) LLC in 2017, Cropper and his wife, Tina, set up business in the former Greenlight Biofuels building on Progress Lane at the Industrial Park in Princess Anne. In the 6,000- square-foot building the Croppers’ have a small lab, two offices, two copper distilling tanks and a wooden barrel housing a copper cooling “worm” for the distilled spirits. Around the still are rockers, chairs and benches waiting for folks to come in and take a tour of the distillery. Unlike high powered corporate distilleries, the Croppers offer a cozy, relaxed one- on- one interaction with their visitors. It is something that fits their personalities perfectly and makes the experience rewarding. “This isn’t about getting rich. It’s about doing something that’s fun and meaningful, and allows me the opportunity to share my craft skill with folks who have an interest in seeing a small distillery operation,” he said. Cropper grew up learning about marketing and sales from his father. “My father started Cropper Oil and Gas Company in Berlin in 1968. So I was exposed to the business end of life. 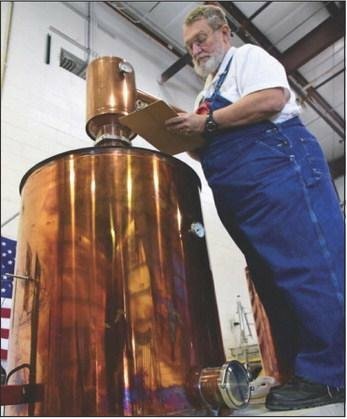 Then one day my grandfather told me that the secret of business success was to ‘find out what people want and go get it’.” So the distillery came into being, now one of just 20 in Maryland and the newest in production. Cropper hopes to produce vodka, whiskey and gin, but figured he wanted to try his hand first at distilling rum and rum-based moonshine. Offered under the Spirits of Patriots brand, the company’s Navy- strength rum has an alcohol content of 114 proof. The moonshine is 80 percent proof.